What Comes Next for American Job Destruction? Since the 1970’s the job opportunities in America have slowly dwindled to the point of total economic collapse, at least for the blue collar worker. No longer can a person expect to go out and get a job at will in the field of his choice. The jobs are now far and few between and they are mainly service related and part time at best. While there are still good jobs to be had in some sectors, these are highly specialized and very competitive. Only a few lucky individuals get them. It leaves very little for the bulk of the job seeking public. Over the years we have seen a gradual decay of the job market from one sector to another. First agriculture jobs gave way to manufacturing jobs. Then manufacturing jobs gave way to service sector jobs. Then full time jobs gave way to part time jobs. The problem with service related jobs is that you must have a productive economy where people have large mounts of excess, spendable income to support the service economy. Most people no longer have the excess money to spend on less critical items. So what comes next in the great American job game? That can only be one thing. Part time jobs will give way to no jobs. The day when Americans can no longer work for others to create income is fast approaching. This means many will need to take matters into their own hands and create their own jobs. When the economy becomes dysfunctional only small business will be able to pull it out. That means more individuals taking the risk to produce products that society needs on the local level. The major impediment to that type of recovery is the government itself. The mass of bureaucracy now in place is meant to stifle any individual productive effort. If government cannot control it, it kills it. This must change and will change once Americans feel enough pain and begin to defy the government. In the early to mid 20th century, mom and pop operations littered the highways of America. Small stores sold many assorted items that allowed families to survive and prosper even in difficult times. This entrepreneurial spirit is what made America what it is or at least what it was. The days of producing products for a worldwide market are largely over for the U.S. which means many of those manufacturing jobs will not come back because we can no longer compete economically. This will force society to embrace former economic models that worked, at least enough for society to survive. This means small scale production directed at local markets. 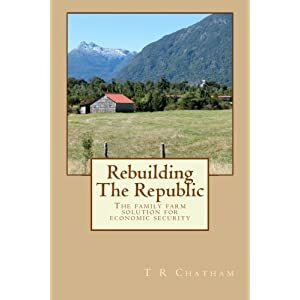 As I stated in Rebuilding the Republic, we will be forced to go back to a society where about 20% of the population lives and works on small diversified farms. This will provide stable working and living conditions for a substantial percentage of the population no matter what the economic conditions are. This will take 20% of the population out of the job market allowing less competition for the few manufacturing jobs that exist. There will also need to be a shift from large corporate systems to smaller local systems. This will spread the profits from sales more evenly across the nation and allow a smaller economy to sustain the population as it once did. Instead of corporations getting the lions share of the profits it will be left in the hands of local merchants and producers who spend it locally. Lets not live under any delusions. The west line has moved to the far east and China will be the next industrial power. America will never again be as it once was. This means we will need to focus on building a smaller more efficient economy that provides the basic necessities for the nations people. That also means the many social programs that many now enjoy will have to go out of financial necessity. We will not be able to afford them in the future. Many will not like to hear that but that is the cold hard reality we must face as a nation. You may not like my conclusions, but do not think that money printing and government controls will solve everything because we already know they don’t. Americans need to realize that the nation as we know it must change the current dysfunctional model if we are to survive as an entity. Change is coming and ignoring it will not do any good. There is a good case to be made for maintaining the old. Once it is built or purchased you do not need to spend money replacing it. The simple act of maintenance and repair will allow you to spend future monies on other necessities. There are some in society that live by the broken window theory. They believe that a broken window is good for society. If a shopkeeper gets a broken window it will force him to spend money to fix it. The window maker makes money. The window seller makes money. The window installer makes money. What they do not understand is that this creative destruction does not allow society to increase its wealth. It is like paying a man to dig holes and another to fill them. You have not created anything new in the end. What happens when an unstoppable government agency meets an immovable public opinion? In this case the unstoppable agency is forced to change course. At least for now. According to the Washington Times, the BATFE has apologized for a “publishing error” that led everyone to believe the M855 ammo, that so many people use, was already banned. There is still a comment period until March 16 on its proposal to ban the ammo. According to an agency statement, “ ATF has not rescinded any armor piercing ammunition exemption, and the fact they are not listed in the 2014 online edition of the regulations was an error which has no legal impact. ATF apologizes for any confusion caused by this publishing error”. The ATF’s statement specified that the exemptions for 5.56mm SS109 and M855 ammo, and for the U.S. .30-06 M2AP bullet “remain in effect”. This is just another case of the Obama administration putting the cart before the horse. Just like the 100,000 illegals that were given documents before the official amnesty period was to begin, they have tried to slip past the gatekeepers by ignoring or rewriting laws that they cannot pass in Congress. If the outrage had not been as universal as it was, it is likely ATF would have left the revised regulations as they were, without the exemptions for the popular ammo and the die would have been cast. This is not the end. They will be back with another scheme to deny the public guns and ammo. This was no publishing error as described because the Obama administration was touting the benefits and need for this for weeks. If it was merely a publishing error, how did they know about it? Government corruption is beginning to wear thin on a populace that has had enough of big government incursions into individual rights. If they cannot get this ban, they will try for something else very soon, that much is guaranteed. As I have stated before, when it comes to guns and ammo, the two critical items are primers and powder. Everything else can be made from scratch or reused multiple times. It’s these two items you really need to watch in the future. When they go after these items, you know they are getting serious and desperate. Just something to keep in mind in the days ahead. Those that claim TPTB want to disarm Americans so they can take control are right to some degree. What many have not yet realized is that there are other items beyond guns and bullets that the government would have to ban to prevent individuals from acting out against the dictatorship many see taking form. One of the things Dave Hodges lists as necessary for martial law is the elimination of guns, ammo and certain chemicals. It’s the certain chemicals that the average person thinks little about but can reap more havoc on occupation forces than bullets. In Iraq it was the IEDs and EFPs that caused the most fear. Most people do not realize that many of the chemicals that they use on a daily basis have multiple uses. It is these everyday chemicals that the government will likely try to ban or restrict just prior to taking full control of the country. Ammonium nitrate is used in ice packs and for fertilizer. Aluminum powder is used for radiator stop leak. Nitromethane is a fuel additive used for drag racing and model planes among other things. When these three items are mixed in the proper way they form a plastic compound similar to C4. Rust is a common element found just about anywhere unprotected metal exists. When that rust is combined with aluminum powder and ignited, it produces a flame that can melt steel. It is commonly known as thermite. Sulfur is used for many different things like gardening. Charcoal is used for things like water filtration and salt petre is used for things like food preservation. When these three items are combined they produce black powder. This is just a short list of everyday chemicals that can be used by individuals fighting a rogue government. That is why these items will likely be taken off the market or restricted at some point to prevent those with the know-how from utilizing every means possible to fight for their freedom. It is not a coincidence that environmentalism will likely be used to remove these things from society’s reach. Just like lead, a primary component of homemade bullets is under fire for damage to the environment and forces are trying to remove it from general use in things like bullets, wheel weights and batteries and is the main reason the last lead mine in the U.S. was closed down last year. This is the reason liberals are so close to the environmental groups. It is a means to an end. Perhaps after reading this things will make more sense in the future when you see seemingly unrelated things happening. When you see legislation banning certain chemicals or products in the future as dangerous you will likely know what the real reason is. This is just one more reason to stock certain items for future use whatever your intended use is for them but you should be careful what you store and where you store it. It is now common practice for police when they search your property to look for certain chemicals that they can use to accuse you of being a bomb maker. So, to some extent, the government is already beginning to tighten down the screws on the public. The long slow march to tyranny has begun and the worst is yet to come. Be prepared and be smart.